1 Boil the potatoes in salted water for about 15 to 20 minutes; or until tender crisp. 2 Rinse the fish fillets under cold running water and pat dry with paper towels. Cut the fish into portion-sized pieces; sprinkle with lemon juice and season with salt and pepper. Set aside. 3 Preheat oven to 375º F. Brush the bottom and sides of an 11 x 7-inch casserole dish with melted butter. 4 Drain the potatoes; leave in the pan to steam dry and slice thickly. 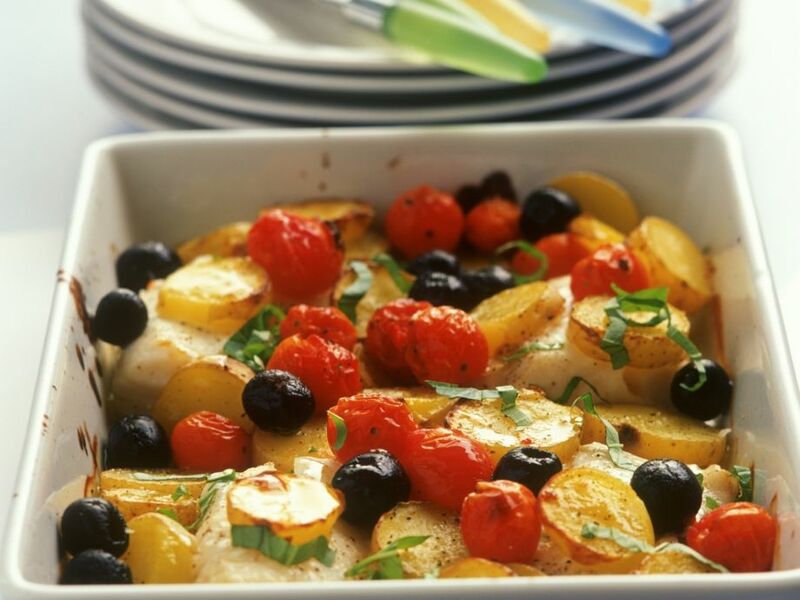 5 Place the fish into the buttered oven-proof dish and scatter with sliced potatoes, tomatoes and olives. Season with salt and pepper and drizzle with olive oil. 6 Bake for about 20 minutes. Remove from oven and garnish with shredded basil. Serve.